I recently attended a practicum for home school moms (and dads). I took a lot of notes at the practicum and I’ve been going through my notes on previous posts, if you are interested. Here’s a link to part one of I don’t know how many parts. It may take a while to get through all the notes. Anyway, one of the things the speaker at that practicum encouraged home school moms to do was to “create copiousness” in their home because our home and our home school are the same place, really. As you home school moms know, learning continues all day long in a home school environment. Copiousness is an abundance of thoughts or words. I looked around today and I think I begin to see copiousness on our home. We have so many delightful, new, rich, yet simple things going on. Here are just a very few. My husband reads aloud to our family after dinner. This is something we started doing for the children, but we find we adults enjoy it and benefit from it as much as they do. He has started reading Classic Myths to Read Aloud by William Russell. We are only a few myths into the book and it is already thrilling. Not only do so many of our words come from these myths, so many fascinating ideas are attached to those words. 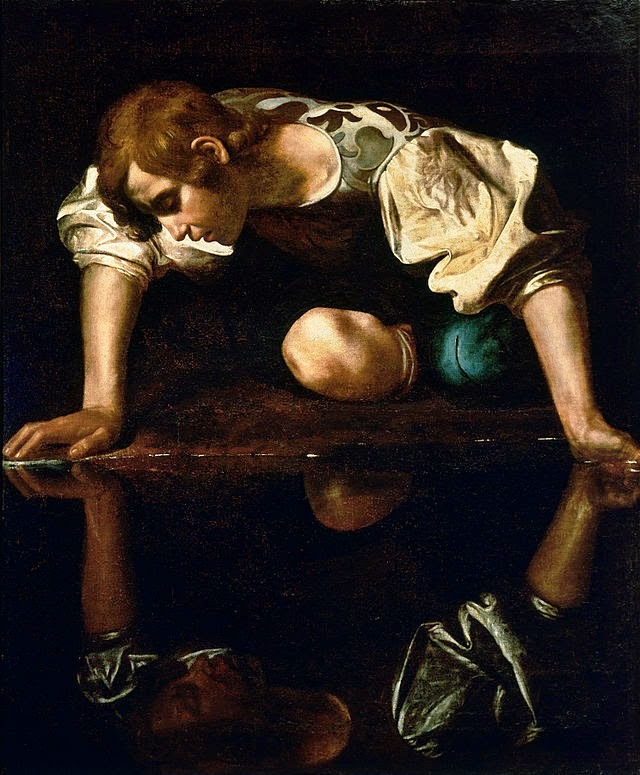 For instance, we read the tale of Narcissus, a young man who became so infatuated with his own reflection that he wasted away. Obviously, the noun narcissism comes from this tale, so my kids are learning vocabulary that they will use and hear used for the rest of their lives. But more importantly, there are important ideas that we can explore when we consider self-love and its consequences in healthy and unhealthy amounts. I believe it will serve our family well to have names like Narcissus and events associated with him like his downfall due to extreme self-love to mention to our daughters in conversations as they grow up. As my husband read, it occurred to me that so many young people struggle with narcissistic tendencies (i.e. selfies, hours in front of the mirror perfecting make up and hair techniques.) Perhaps ancient people created these myths as warning to young people since human nature was the same back then. Anyway, I am already enjoying the copious thoughts and conversations these stories are fostering in our home. I know I will continue to enjoy recognizing these stories when they come up in other poetry, literature, music, etc. through the years. It’s important to give kids great words and ideas, yes. But they also need some practical skills! What’s the proverb? Give a kid a fish, feed her for a day. Teach a kid to make pancakes and she can make you pancakes everyday for the rest of your life. My daughter has learned to make pancakes. I’m a genius! No, seriously. She’s made pancakes every day for a week now. And that means she has made just about every mistake in the book and she’s pretty much a pro, not at making pancakes, but a pro at solving her own pancake-problems as they arise. And she’s so proud of herself. She ought to be. I couldn’t make pancakes until well into my twenties. She’s managing something significant and practical, doing something well, making breakfast, that she will need to do for herself and perhaps many others every morning for the rest of her life. She even made pancakes for her dad yesterday. He lingered a little longer than usual that morning before going to work, so he was here to have breakfast with his girls. He sat with her and her sisters and ate his oldest daughter’s pancakes. It was a beautiful moment. Very often, all this copiousness creates more and more questions. My daughter has been asking tons of questions about cooking, probably because she’s cooking more and so she’s thinking about cooking. And I don’t know about your kids, but my kids tend to ask their questions at the worst times. It’s like they have a sixth sense for when it is the worst time to distract me with an intriguing question. Like when we are in the van and I am in heavy traffic and trying not to kill us, it never fails, from the back comes a loud, urgent question. Or when they are doing chores, out from their bedroom they come with another really good question and it takes me at least a few moments of standing there with my mouth open and with my hands in dishwater to remember they are supposed to be cleaning. So now, instead of telling them “Ask me again later!” and totally forgetting what the question was entirely by the time we are free to think about it, we agree to write it down right away on a sheet of paper or something and then get back to whatever it is we were doing. We are using the white board to collect our questions for now, but I think I may actually need to make a permanent place in our house to record our questions because I have a feeling the questions are just beginning. Another thing, we’ve taken up jacks. I don’t know about you, but I am always jealous of kids in old novels who know how to use a sling shot, or a yo-yo, or marbles, etc. My kids feel the same way. I think we’ve probably lost as much as we’ve gained with all our technology. So we are trying to learn to play games that don’t plug in to power outlets. For now, we use this set of extra-large jacks and ball, but we have ordered a traditional set that will come in the mail soon. I’m not going to lie, it’s been difficult for my kids to keep at this game long enough to see themselves improve. They complain but they keep playing. It’s good for them to confront their own limitations, frustrations, and to practice persistence. It’s not an easy game, so when they actually catch a jack and the ball in the same hand, it feels really good and we all celebrate. We’ve also ordered marbles (a shooter and a matching set for everyone in the family) and pick-up-sticks. This fall/ winter in front of our fire place is shaping up to be quite entertaining! We also play chess in front of the fire in the fall/winter, so I am really beginning to look forward to the change of seasons, for once! I am reading this book to myself right now. That’s right, I am reading a math book. (As needed, I take out a pencil and do problems so I can make sure that I understand a concept.) For other people, math has nothing to do with religion. But for me, I am praying my way through this book. I did not do well in math in school, but I believe God wants me to understand math, even enjoy it, if for no other reason than to help my kids understand and enjoy it. When my kids are in upper level math, I will probably still hire a tutor and/or have my brilliant husband help them, but the great thing about home school is that I get to redeem my own education as I facilitate my kids’ education. We will start our school routine again later this month, but for now, I am enjoying an abundance of leisure time (thus this blog post.) It’s been such a rewarding summer since we’ve been able to relax enough to begin reading and learning new things and adding new skills and games to the abundance we already enjoy in our home/ school. I spent some time working on calendar skills with my four year old today, letting her draw the illustration for the month of January. I got her a calendar that allows her to draw her own pictures for each month. I also helped her label the days we go to Classical Conversations, my part-time job at the gym, vacation and church. She’ll be five in a few months, so it’s about time to start teaching her calendar skills. Make Your Own Lunch, Kid! I dreamed this day would come and it’s here, finally! My eight year old has been making lunch for herself and her younger sister, who is three, for three whole weeks now! It all started when it just occurred to me that she not only wants to do “grown-up stuff,” she really is getting old enough for certain “grown-up” things. All she needed was some intensive instruction from me to get her to the point where she could get everything out safely, prepare it all, put everything back and clean it all up. All I needed to be was patient enough with her the first few days to see it through. So we settled on one meal, just one, that she would master by doing it every day for the foreseeable future: grilled cheese and fresh fruit. It’s my job to provide the necessary groceries, of course. And I am always in the kitchen doing something so I am here to supervise. But she does everything else, starting with taking the four slices of sprouted bread out of the freezer to thaw ahead of time to wiping off, dismantling and putting the cooled griddle back in its place. Yeah. It’s awesome. I do plan to teach her to make another meal besides grilled cheese, eventually. We will probably do the same thing we did this time and make that meal for a few weeks so she can really get a handle on it. But, for now, the girls are enjoying their grilled cheese time and it’s working out just the way I pictured it in my home school daydreams. This is an easy activity to practice the months of the year. Write the months on a piece of paper, let the kids cut them out (this will buy you at least five minutes free time) and then let them rearrange them in order. You can also do this with days of the week, planets… anything that needs to be put in order. And since you didn’t spend a lot of time making these by printing them, laminating them, cutting them out just perfectly, you don’t even have to keep them. Just toss them when you are done reviewing.